There’s something rather appealing about visiting a place that can lay claim to a title. Capitol of, most northerly, most westerly, most inebriated. You get the idea. For our first full day’s walk since returning from Mull we had another such location in mind, this one being the highest village in Wales. 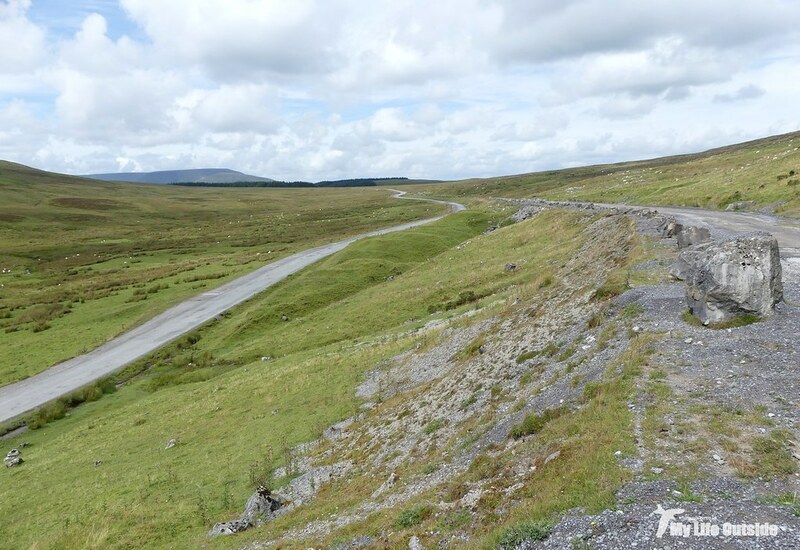 Sitting 409 meters above sea level Trefil, as it’s more commonly known, lies right on the boundary of the Brecon Beacons and to be honest hadn’t crossed my consciousness before now other than a glimpsed road sign as we blasted our way out of Wales along the Heads of the Valleys road. So why now? 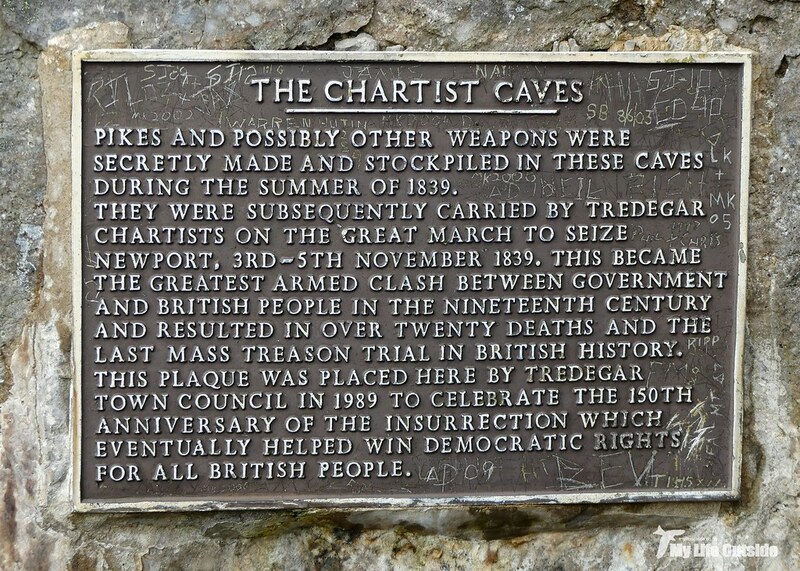 A good question with no more a complex answer than I happened to see a photo of the Chartist’s Cave whilst browsing the web and immediately thought to myself – I have to go there. Out came the OS maps, routes were plotted and on our first free Saturday we found ourselves looking down the broad Sirhowy Valley having just climbed out of Trefil itself. Even on a typically dull summer’s day I’d liked Trefil immediately. It had that combination of natural beauty and dilapidated industry which I so love, remnants from a bygone era when limestone quarries chewed their way into these rolling hills. Most have long since closed but I was surprised to find a large operation immediately north of the village still open, its modern machinery and structures commendably hidden from the wider surroundings. 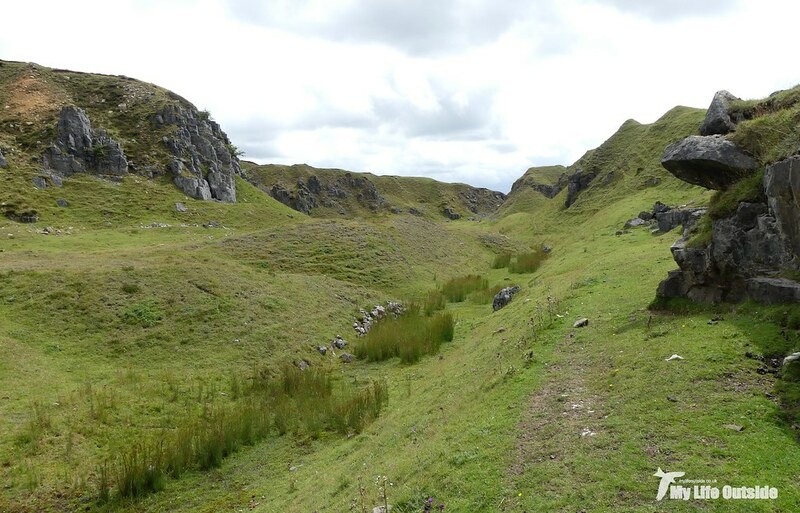 If only the old tramroads were still in operation connecting this remote location with the Brecon canal and heavily industrialised south. What an attraction that would make! 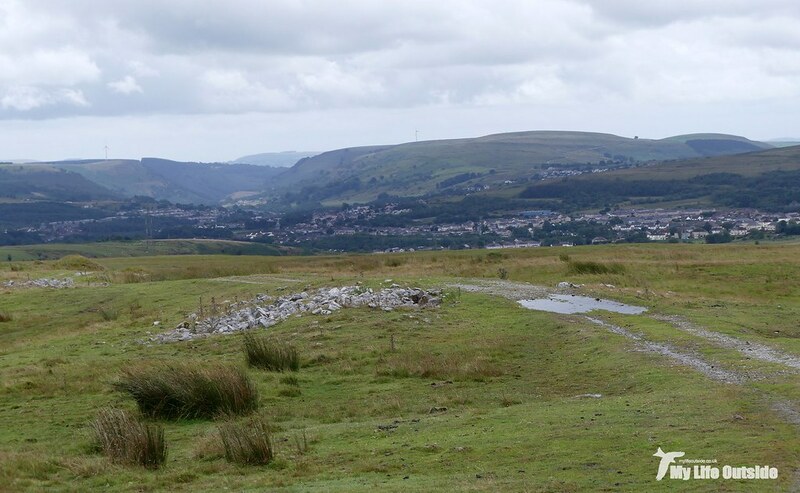 We followed the quarry boundary north for a good distance before peeling away and striking off across the untamed and, on initial impression at least, featureless top of Mynydd Llanggyndir. The going was relatively easy compared to what we’d been used to over the past few weeks so we made good progress in the company of numerous Wheatears, Meadow Pipits and Skylarks. This wasn’t really a day for birds however as we were instead focussed on hunting down a couple of historically significant sites, the first of which I’ve already mentioned. 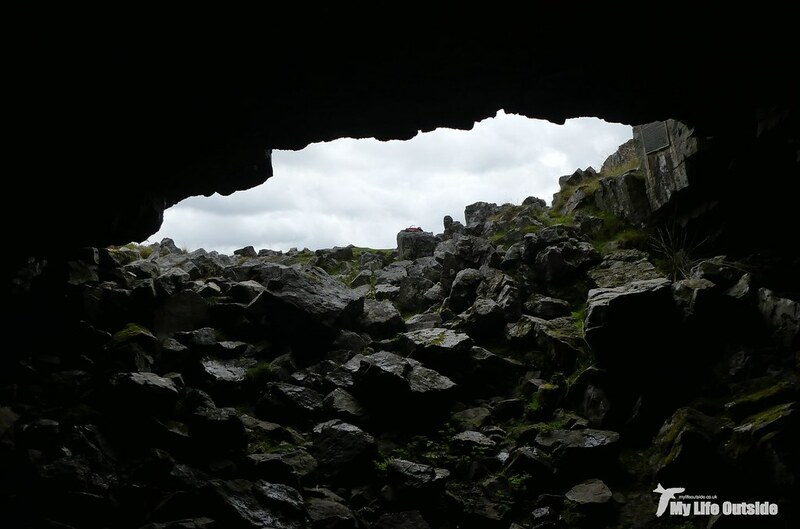 Traditionally known as the Big Cave or Great Hole, the Chartist’s Cave took on its current moniker thanks to an event in 1839. At that time unrest amongst the populous was rife thanks to a failure by the earlier Reform Act of 1832 to grant voting rights to anyone other than those who owned land. This led directly to the publication of a People’s Charter in 1838 which set out six clear goals which we would all recognise today as the basis of our modern democracy. At the time though MP’s were a less broad minded bunch (some would say still are) and having received a petition of some 1.3 million signatures on the subject refused to even hear their cause. An outpouring of anger was inevitable. Whilst some called for general strikes others favoured more direct action and a series of marches were planned to converge on the Westgate Hotel, Newport over the 3-4 November with the aim of taking the town and causing an uprising. Perhaps inevitably the establishment had other ideas. Filling the hotel with soldiers a violent confrontation was unavoidable resulting in the deaths of twenty marchers and disastrous press for the entire movement. Today memorials dot south Wales but perhaps none is as evocative as this cave, its remote location a perfect hiding place in which to stockpile weapons used by those marching on Newport. 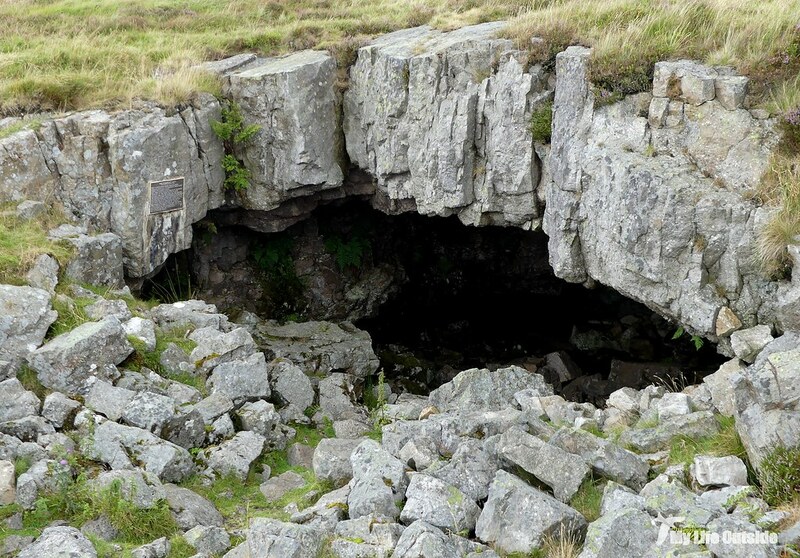 Although we only explored the cave mouth there is a narrow opening that leads into a deeper chamber and from there onwards into a network of tunnels which underlie this moor. Not somewhere to venture unless properly prepared so we ventured back into the open and headed over to a large cairn which we’d spotted on our way in. 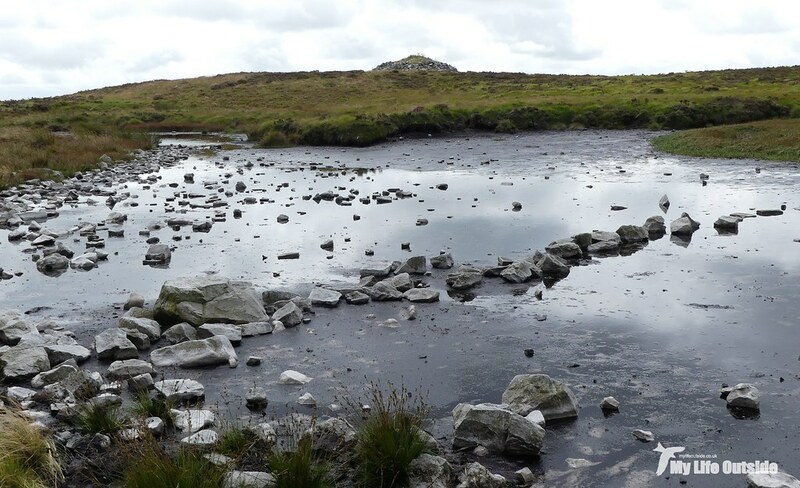 Marked on the map as Ty Aderyn it sits at the head of two small pools (Lyn y Garn-Fawr), the nearest of which is crossed by a dead straight section of wall. 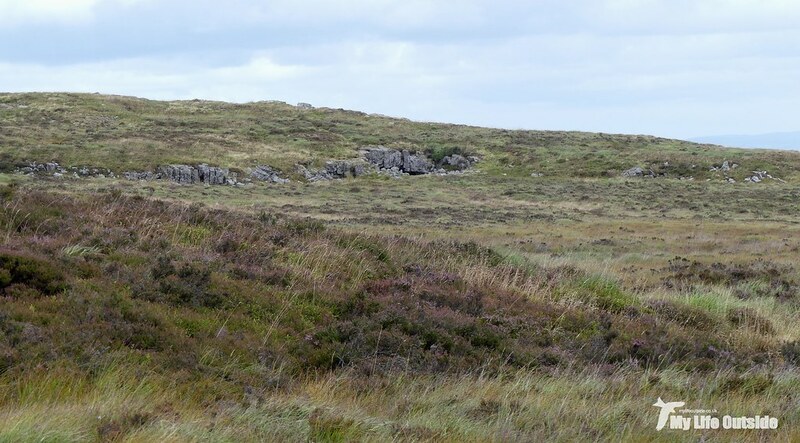 I’ve not been able to dig up much information on either save for the cairn being a burial mound so I’d be grateful to hear from anyone who can shed a little light. 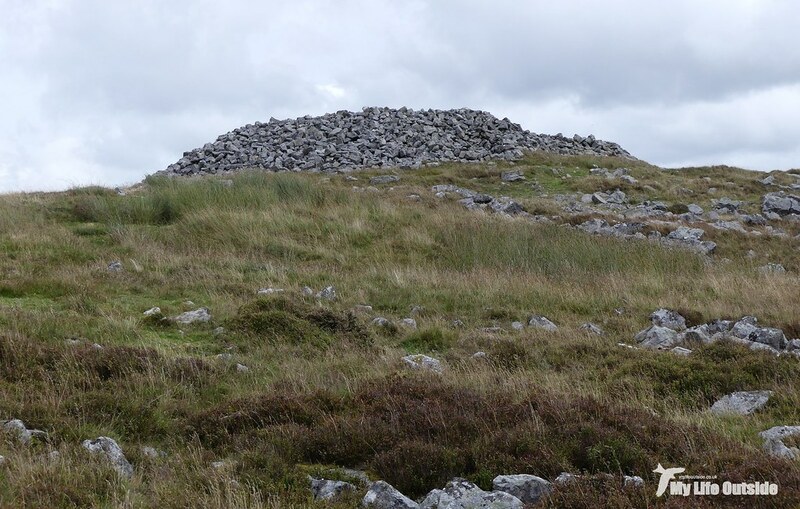 Thankfully the nearby Bronze Age cairn at Garn-Fawr is much better documented standing 2.5 meters high with a diameter of 20 meters. Up close it was certainly an imposing structure with expansive views in all directions from up top and clear signs of more recent disturbance. 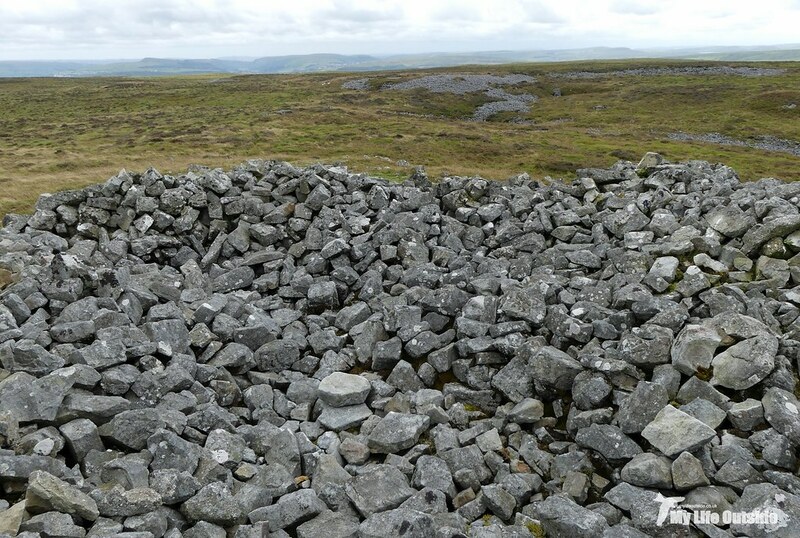 Three modern shelters have been constructed in its sides and the top hollowed out at some point leaving us to wonder just how grand it might have looked when first erected. 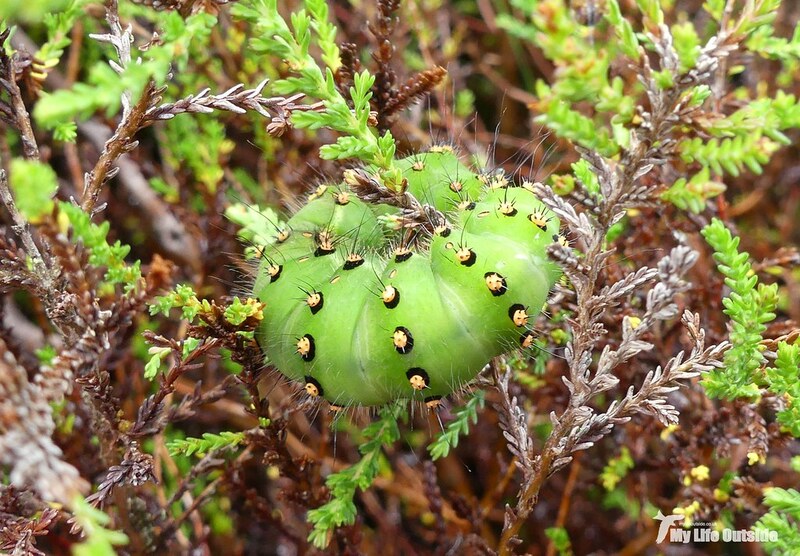 On an entirely different scale and something I definitely hadn’t been expecting to find was this Emperor Moth caterpillar in Heather nearby. Trust me, this thing was large! Dropping back off the moor we soon found ourselves amongst the limestone quarries once more, the largest of which operated for a hundred years from 1819 to 1919. 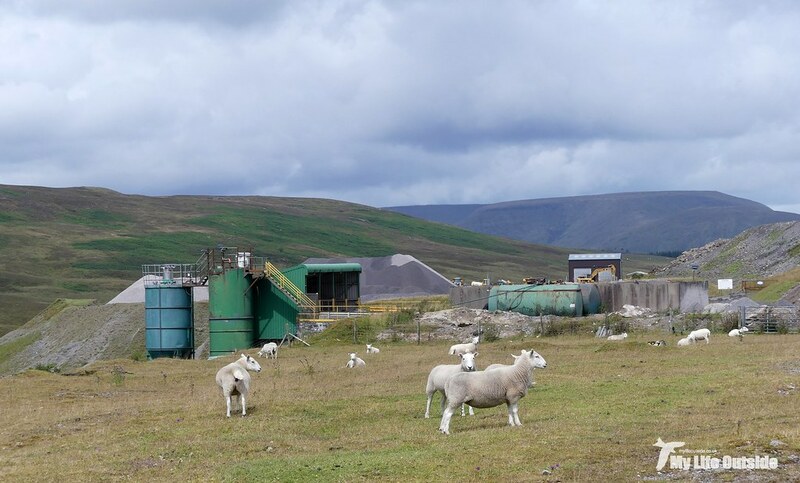 The intervening years have softened its edges and greened over most of the spoil tips but there’s no mistaking the scale of the place or what level of employment it would have once offered to the surrounding area. 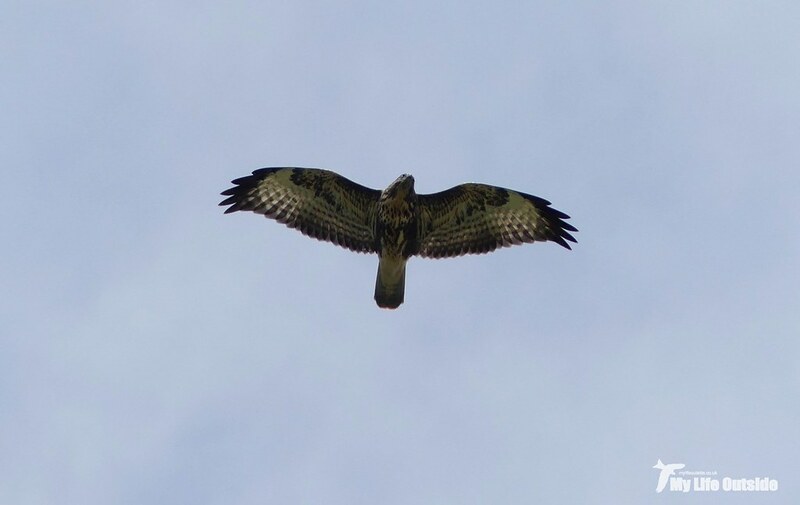 Today we had the place pretty much to ourselves bar a flock of Sheep and pair of Buzzards which, given their continuous calls and close flight, must have been nesting somewhere up in the rock face. And still there was one more feature to find. Beneath the quarry the valley flattens out into a wide grassy area nestled within which sits the Dukes Table. 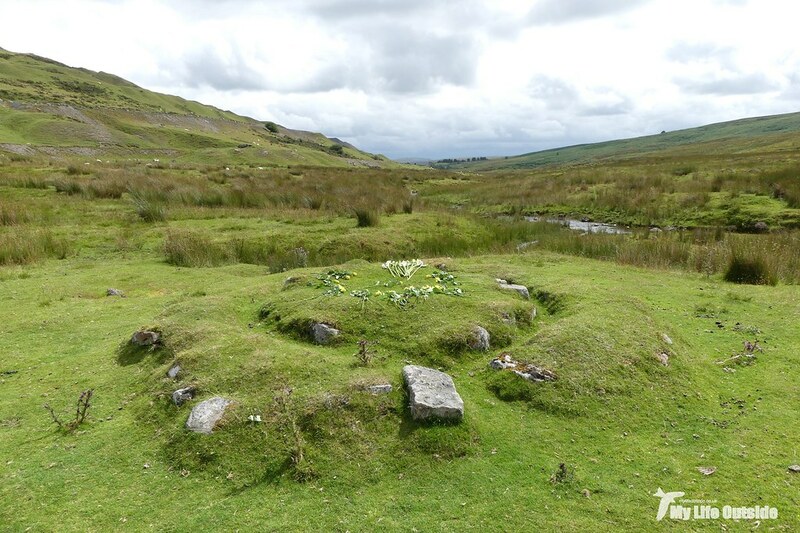 Legend has it that this circular structure was used as a dining table during hunting excursions with wine being chilled in the nearby spring which allegedly never runs dry. How much truth there is in these tales I’ll leave to your own imagination but they certainly conjure up evocative images in my mind. It’s hard to think of many other places that can cram in such a density of history, both modern and ancient, in as small an area but Trefil does it with ease and is well worth a visit if you get chance. 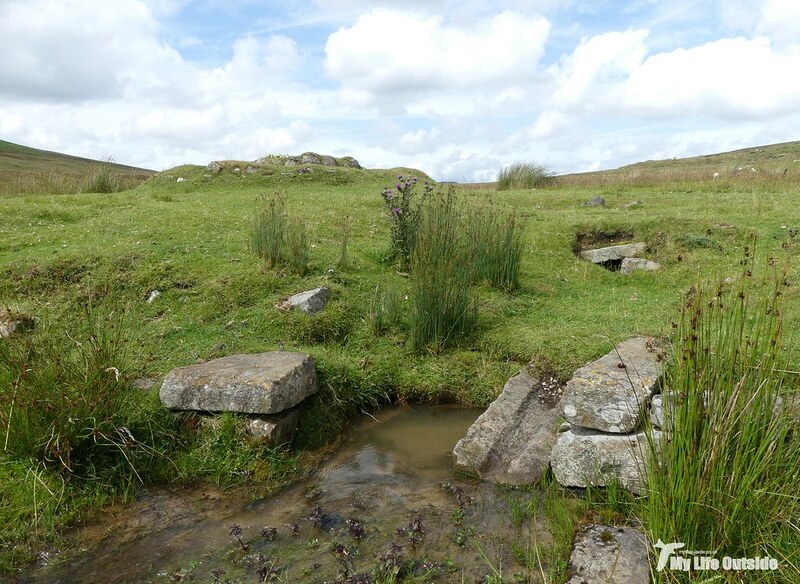 We ourselves have another trip planned as the opposite side of the valley is littered with more old quarry workings which are just begging to be explored.